If you’re planning on attending either Delightful Evening Eating Pizza, please leave a comment on this post indicating your name and your intentions. Nothing is written in stone – if you decide at the last minute to back out because you are afraid of hanging out with such cool people, no one will hunt you down – but a rough number (with info about when you’re getting to the city, if you’re interested in the Friday outing) will help us to make any necessary reservations. 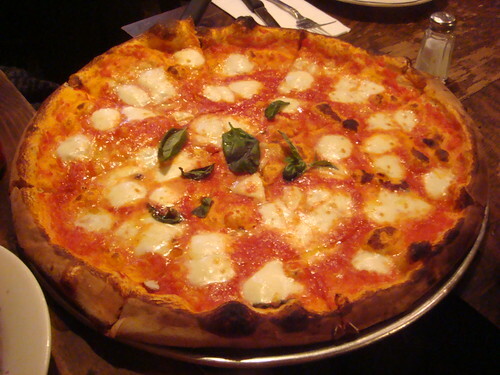 A note on the picks: Many of the most renowned pizza joints in NYC (a) are very far from the WordCamp venue, (b) are very small, (c) have very long lines, and/or (d) do not accept reservations. For those reasons, I’ve chosen joints that are a little less well known (though very good! And representative! I swear!) If you’ve got your heart set on one of the more famous joints, you’ll have to plan your own trip (though I’d be happy to give advice). Because of various travel plans, we’re anticipating that fewer people will be available for pizza on Friday night. A smaller group means more flexibility, so we’re headed to Brooklyn, home of the greatest rappers, and arguably the greatest pizza. 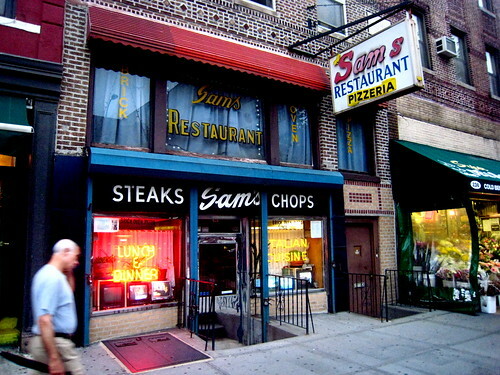 Our destination is Sam’s Restaurant in Cobble Hill, a few stops from Manhattan on the F train. Because there’s a WC speaker get-together at 8pm, we’ll shoot for an early dinner, around 6pm. For you out-of-towners, I’m sure someone from the CUNY Pie gang will lead an expedition from Manhattan. Sam’s is a casual place with pretty reasonable prices. Your fill of pizza and a beer or two should be somewhere in the $25 range. Get there yourself – The closest stop is Bergen St on the F. Exit the station near the FRONT of the train. You’ll find yourself at the corner of Smith and Warren. Walk one block west (Rite Aid is on the SW corner of the intersection); when you get to Court St, turn left and walk about a block. Sam’s is on the west side of the street (238 Court St). <3 Be my date <3 – I’ll be coming from Manhattan, and would be happy to have company. Meet at the NE corner of 34th St and 6th Ave. I’ll be the tall, extremely handsome and charming blond guy standing in front of Victoria’s Secret (where else?). Leaving at 5:20 sharp. @ me if you have questions. For Saturday we’ve chosen Luzzo’s. It’s a pleasant 15-20 minute stroll from Baruch. The pizza here is more in the Neapolitan style than the Brooklyn pies at Sam’s. That afternoon’s festivities at WordCamp are set to wrap up around 6pm. In order to give people a chance to take a breather and perhaps acquire some liquid refreshment, the plan is to make an 8pm reservation. (If you object to this timing, please state your case in the comments!) I’ll be making reservations at Luzzo first thing Wednesday, so it’s especially important that if you’re interested in this outing, you leave a comment below. Luzzo’s is a bit more expensive (like everything else in Manhattan, grumble grumble curmudgeon kidsthesedays). I estimate that, based on shared pizza and appetizers, a drink, and tip, a person can get out for around $35. ‘WordCamp’ and ‘pizza’ – hey, they even SOUND alike! Hope to see you at both! Count me in for Friday! Saturday may be tricky because I have to hop on a train to DC at 9. I’ll be there Friday for sure, possibly also Saturday. Count me in for Saturday. I grew up in the NYC/NJ area and boy do I miss the pizza! If there’s room for me, I’d love to attend both! My wife and I are in for Saturday if it’s not too late! Totally in for Saturday night. And is it me or does CUNY pie sound totally dirty? Yeah my mind is in the gutter. Count me in for Sat. night. Possibly Friday too. I’ll be there on saturday! I’m not going sat night afterall (but I’m not afraid of the cool people).